Long Island, New York has had its share of the blues over the decades, with artists like Little Buster and the Soul Brothers, Toby Walker, and Sam "BluzMan" Taylor helping to establish "The Big Fish" (as it's known on the music circuit) as more than just a cultural step-child of Manhattan. "Harmonica Bill" Lifford and his band -- Harmonica Bill & Marked Deck -- want to help bring the Big Fish back, with a sound which harkens back to another city and another time. A sound which HB calls, "low-down Chicago blues...1950's-era, Chess-Records-style blues, like you'd hear when you put on a Little Walter album or a Muddy Waters record." When asked about the dearth of real blues in recent years, HB says, "I just think that Stevie Ray Vaughan and the guitar hero style of Texas blues and such kind of got people into things that are more spectacular and less in the pocket," then sums it up with, "More emphasis on flash than on the groove. That’s just not us. We can get things cooking, but we always keep it in the groove." A blues fanatic for three decades (and a harmonica blower for twenty-eight years), HB has been invited to sit in with the likes of Son Seals, the Allman Brothers Band, and even got to play a few tunes with the house band at the legendary Checkerboard Lounge in Chicago. 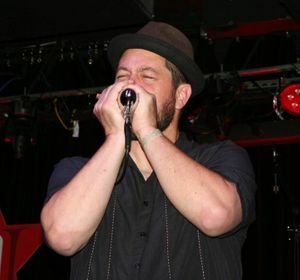 He put together Harmonica Bill & Marked Deck three years ago, first recruiting Long Island blues veteran Ken Clayton, a lead guitarist/vocalist with whom Harmonica Bill formed Chicken Foot Express in the mid-nineties. Clayton (who also, HB adds, "plays a mean slide") is himself a blues traditionalist, yet - like the rest of the band - unafraid to push the bounds of the genre. Junior Davis, the West Coast Blues aficionado of the group, primarily lends his big tone to the mix on rhythm guitar, augmented with the tasty leads which reflect his Kid Ramos and Alex Schultz influences. Rounding out the band are bass player Rich Albertson ("…there is simply no finer an electric blues bassist," HB touts) and drummer Doug Dean, the newest member, bringing his jazz-influenced playing and decades of experience into the fold. 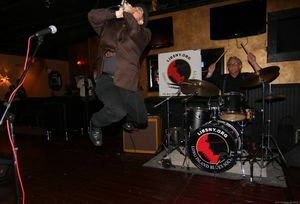 Although relatively new as a band, these seasoned pros have been tearing up the local and regional circuits, recently winning the Long Island Blues Society's 2018 Blues Challenge. They'll be representing the "Big Fish" in the International Blues Challenge in Memphis, Tennessee next summer, bringing their unique Long Island take on a classic Chicago sound down South.